A new treat for the thanksgiving from me!! I have been thinking of making something new for this thanksgiving, so came up with this idea of making laddus with pumpkin. I am so happy that it turned out so delicious and everyone liked them. Dry roast semolina until it turns golden brown. Then transfer to a plate and keep aside. In the same pan heat ghee and add cashews + raisins and fry till cashews turn golden brown and raisins bubble up. Then add coconut and again fry till it changes color and turns into light brown. Later add the pumpkin pulp + sugar and mix well. Keep stirring the mixture until all the sugar gets melted and the mixture attains a soft halwa stage. Finally add the roasted semolina to the pan and mix very well so that no lumps are formed. Keep stirring the mixture gets thickened (until 2 minutes). Turn off the flame and leave the pan for some time until the mixture cools down and is easy to touch. When it is cool enough to touch, take small portions of the mixture and make into balls of desired size. Spread on a plate to dry for some time until it gets hardened. Please Note: As we added pumpkin pulp, it takes a little more time for the laddus to harden. Enjoy these yummy laddus any time of the day. This is my thanksgiving treat for my family. I wish you all a VERY HAPPY AND FUN-FILLED THANKSGIVING!! 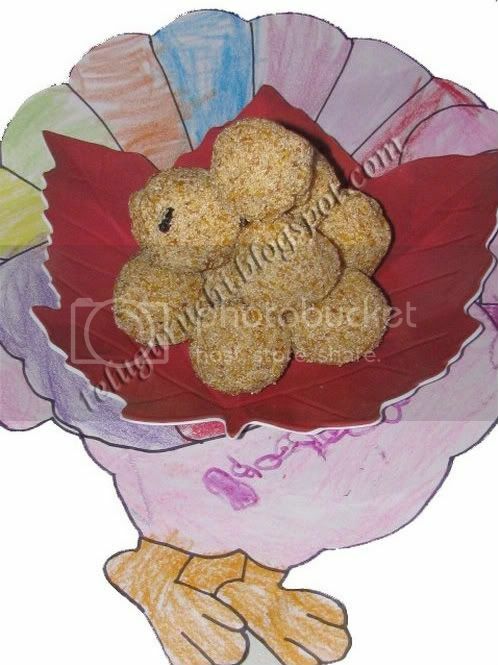 Wow..What a creative idea..pumkin laddus..hmm... looks yummy. Wow, they look so delicious! 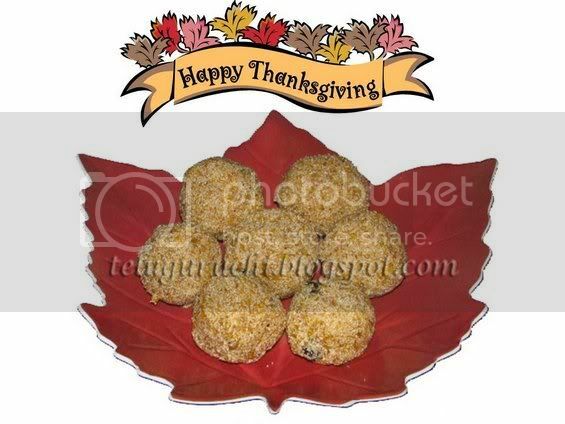 Pumpkin ladoos wooow Uma that is a Desi way to celebrate Thanksgiving! Have a wonderful Holiday! wow.....Uma very creative dear....looks delicious..........and healthy. I appreciate for your beautiful presentation. Very innovative type of making laddoo. Looks yummy and mouth watering. Thanks a lot for this lovely and yummy recipe of laddoo. Please collect your award from my blog. Looks like a combo of pumpkin halwa and rava ladoo. Though I have made both, never thought of combinging them. Very innovative. hmm..thats a fusion recipe..nice color. Wow! Innovative and delicious! Nice presentation! Wat a delicious fusion sweets, watelse we need to celebrate Thanksgiving..very unique dish Uma! Great way to use pumkin, Happy thanksgiving!!! yummy laddos and very creative idea,..
Nice comb dear....Laddoo looks yummy and perfect. Pumpkin halwa...great innovative recipe..I am sure it taste as good..Nice presentation. yummo..never thought of mixing pumpkin and rava to make laddoos. Creative laddoos indeed..
Thats a very unusual but awesome combo uma! Looks lovely! This is a creative snack Uma. Unique idea, looks delicious ! That's innovative, Uma. They must have been delicious. LOL Uma...you are a genius in trying new things :) The laddus look delicious!